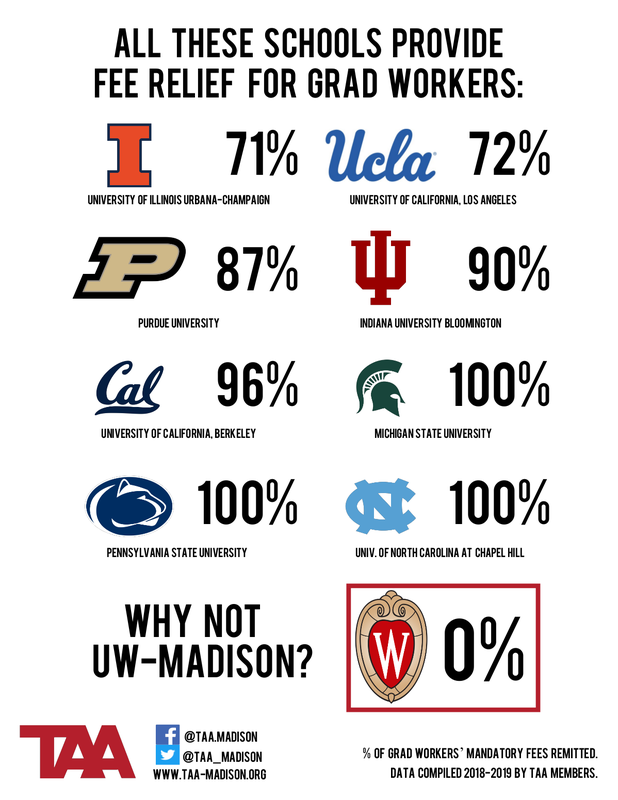 Graduate workers pay more than a thousand dollars a year for mandatory fees so that they can work at UW-Madison. For a typical graduate appointment, this is ten percent of their wage paid back to the university. Many graduate workers experience food or housing insecurity because of the fees in addition to unfair pay. Read about Lin’s story and Nathan’s story. And there are many other graduate workers whose quality of life would improve if the university covered mandatory fees. Graduate workers need less than 0.21% of UW–Madison’s current budget to pay for our mandatory fees; meanwhile the UW System is preparing for a budget increase of hundreds of millions of dollars over the next two years. The university has the funds to provide full relief from mandatory fees while increasing the pay for grad workers. Peer institutions like Michigan State University and University of California–Berkeley cover more than 95% of mandatory fees for graduate workers and provide higher pay. Hundreds have signed a pledge to call for immediate action: https://bit.ly/pledgeTAA. Graduate workers are organizing a sit-in at Bascom Hall on Friday: https://www.facebook.com/events/2494026830630180/. Read more about the mandatory fee campaign here.